On my desktop (my laptop, not my actual desk) are .jpgs of paintings of women reading books. I dragged them there from the Internet, not quite knowing why I was doing it. But now I realize something in me relaxes when I look at them. The women are all in repose, sitting or lying down. Lost in what they are reading, deep in concentration. They look healthy. When we are that relaxed, we are. 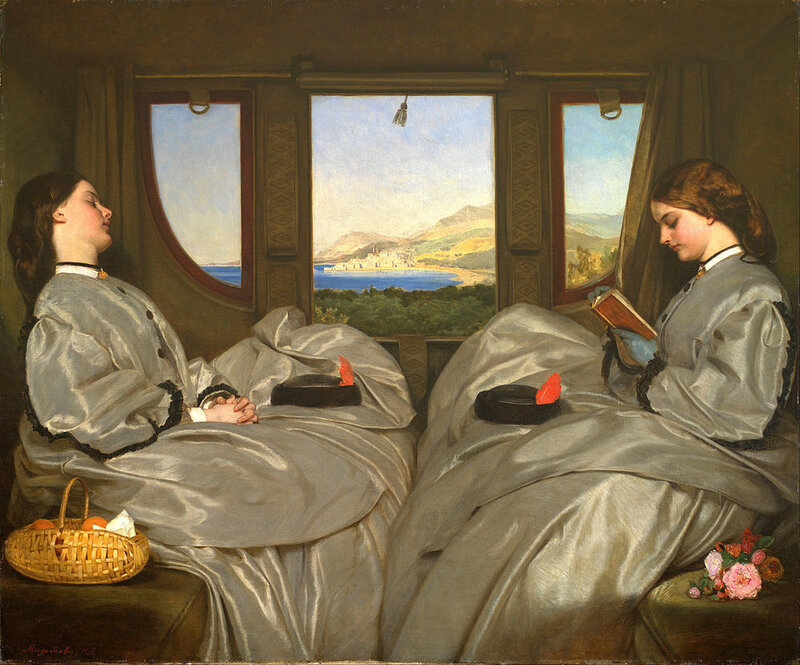 In one of my favorites, The Traveling Companions (1862), by Augustus Leopold Egg, two girls who look like sisters and are dressed exactly alike, sit on opposite sides of their train compartment, opposite sides of the composition. There is an almost perfect symmetry between them, their hats resting in their laps in exactly the same manner, their silk dresses which, when they meet in the middle of the compartment, look as if they are different folds of the same piece of cloth. One girl sleeps while the other reads. Each is resting in her own way. When we read novels or short stories we’re supposed to want tension and conflict, at least that’s what we’re often told, but I don’t care about conflict in fiction any more than the other elements that might appear there. It’s usually narrative voice to which I’m drawn, for the way it sounds, for its particular way of bringing the reader through an experience, for the way it can create atmosphere or feeling. To read relaxation should be boring, for what are we paying attention to when we encounter it? How is it driving the story forward? Something is always supposed to be driving another thing forward in some way. And if we stop for a little while, can that not be interesting too? She forgot the shop, the other customers, her own errand. She forgot the winter air outside, the people going by on the wet pavements. She forgot that she was in London, she forgot the whole of her London life. She seemed to be standing alone in a darkening orchard, her feet in the grass, her arms stretched up to the pattern of leaves and fruit, her fingers seeking the rounded ovals of the fruit among the pointed ovals of the leaves. To read this scene in its entirety is in itself hypnotically relaxing. Laura buys a huge bunch of chrysanthemums and in return the grocer gives her a spray of beech leaves. She is practically addicted to their scent. “Where do they come from?” she asks, and that is how she finds her future. She knows instinctively she must go there. And so she does, amidst protestations from her brother and his wife. She rents rooms in a cottage in Great Mop and sets about exploring, almost frantically at first. But soon she slows down and life becomes what it was meant to be. She wants hardly anything she knew before. Even her nephew gets on her nerves when he tries to visit; he interrupts her relaxation. Ah, we have found some conflict after all. To interrupt another’s contentment in this way, it isn’t nice. Like the women in the paintings I look at, I do most of my reading in bed, taking a break from work in the afternoon, or at night before I fall asleep. In winter, I very occasionally put off work for a couple of hours to read in the morning. Reading, then, is almost always relaxing, even if what I’m reading isn’t. The detail of the window level with the rim of the bathtub is perfect. Perhaps I am neurotic, but is it not relaxing in its own right? And the fact that it is completely open to the storm? To be in a warm bath and exposed to a storm at the same time. After one gets out of the bath the feeling stays around for a while. The same thing can happen with reading. When one closes a book it doesn’t mean the feeling of the book closes too. Maybe it’s this way our favorite books have of staying with us, but I find myself returning always to Clarice Lispector and Marguerite Duras, in my thinking, but also when I write, and I’ve realized that it might make sense to focus on them through writing for an extended period of time. It’s said that it only takes seconds for the body to tense up, but that to relax completely takes much longer, more like twenty minutes. Maybe spending a long time thinking and writing about a subject allows for a great opportunity of relaxation. Regardless, I like reading The Ravishing of Lol Stein partly because of the state of mind in which it puts me. Again, I don’t think that was the goal, but a novel in which a woman walks again and again through the empty streets, how could it not be relaxing, no matter why she is walking.